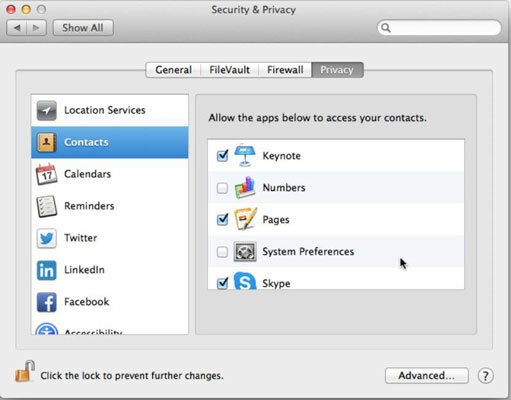 Choose Command→System Preferences and then click the Security & Privacy icon. If the lock icon in the lower-left corner of the preferences window is locked, you must unlock it to make changes to your preferences. Click the lock icon, type your password in the dialog that appears, and then press Return to unlock your preferences. The Privacy preferences pane appears, as shown in this figure. Click each app in the list to allow other apps to access that app’s contents. For example, click Contacts and then click the apps in the list on the right to give them access to Contacts. Each time an app requests access to information in another app, it will appear in the list for that app’s Privacy preferences. 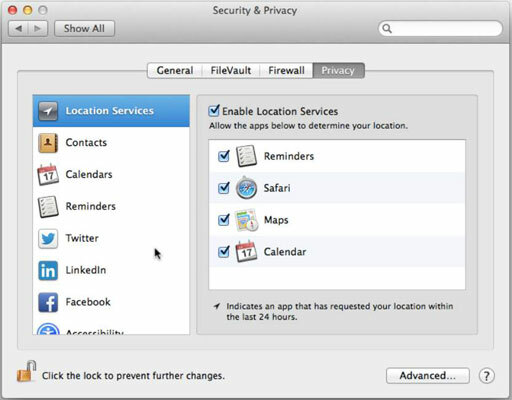 Location Services: Select the Enable Location Services check box, as shown in this figure, to allow applications that use your location to access it — for example, Safari and Maps. You can selectively allow access only to certain applications or deselect the check box and prohibit access altogether. Diagnostics & Usage (scroll down the list of apps to find it): Select the Send Diagnostic & Usage Data to Apple check box if you want to send a message to Apple when you have a problem, such as Safari crashing, or to let your Mac send a message about how you’re using it from time to time. The information is sent anonymously, so you don’t have to worry about being spammed or anything.